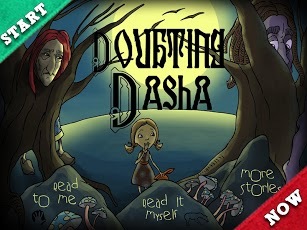 Doubting Dasha: New EPIC Story for KIDS! Once upon a time there was a small village lying on the edge of the darkest spot in the forest. Its people were all happy and they were also well fed, leading normal and happy lives. However, one day they noticed their grain supply started to dwindle up to the point they feared they’d be left with no more food supplies. They started wondering whether the one responsible for this was the odious creature living in the forest. And here is where the story of doubting dasha begins. She is the main character of this android app and she doubts whatever the villagers believe about the dwindling food supplies. 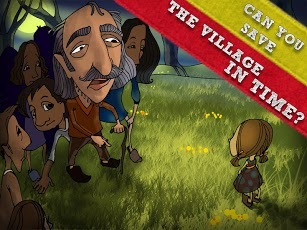 Due to her disbelief, she eventually wanders into the forest, discovering that indeed there is a vile creature responsible for the villager’s problems. However, she is not alone in this quest, because on her way into the forest, she finds a magical rock that advises her on every move she’ll make. As the players wander through the path of their choice, they can choose whether to doubt the creatures they meet or be fearful. There are plenty of creatures Dasha will have to face during her adventure, including witches, giants, werewolves and zombies with some of the tasks she’s assigned with being very challenging. The way she’ll take on her enemies requires her to improve her archery skill, so that she can defeat the monsters encountered easily. The game is very detailed, with a graphic novel animation style that makes it look really special, easily moving it out of the junior category. Many of the neighbors will have very strange requests for Dasha, but she needs to be clear with her objectives and never forget her goals. However, will this be enough? Well, players just need to put their own doubts aside to find out.